Burning Moon's Inside advice: Dream Drop Bath Bombs Giveaway & Review! Aside from the ingredients the number on thing that draws me to a bath bomb is the scent, now seeing as how they haven't invented a device yet to let you smell through the computer screen sometimes you have to take a chance and buy a product even if you aren't certain it will smell the way you want it to. 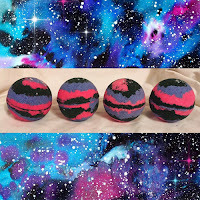 I like bath bombs that not only scent your bath water but leave you smelling like the amazing bath bomb as well and Dream Drop Bath Bombs did exactly that with their out of this world bath bombs. 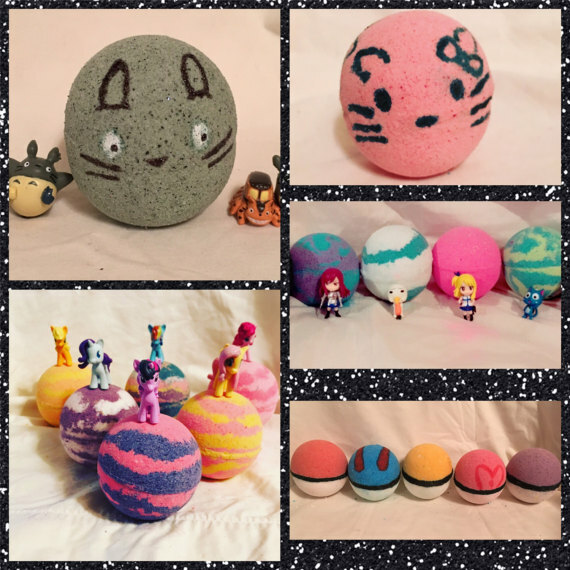 For my recent review I was sent four bath bombs to test out, one was a Pokeball in the scent "Lilly of the valley", a Totoro in the scent "Harvest Spice", a Galaxy in the scent "Dream" and a Anti-Valentine glitter heart in the scent "Love spell". The heart I am saving as part of a spa goodie pack that I will be putting together for a giveaway so the actual review for that item won't be included here, but I can tell you it smells beautiful. I personally tested out the Galaxy bath bomb, the scent is modeled after the gap fragrance and it smells quite lovely. The bath bomb is made from all vegan cruelty free products including baby oil, coconut oil, shea butter and more so I do have to note that this made make you bath water a little slippery as well as your skin, if you do not like the silky smoothness you can rinse off before getting out of the bath. I like that they do not include corn starch in their bath bombs which can lead to yeast infections if you take multiple baths a week using products containing it.This bath bomb is large enough to fill the entire palm of my hand so it takes a little time to fully dissolve into the tub, I would place this into your bath when it is about a quarter of the way full. During my bath I could feel the oils working their way into my skin and moisturizing it and I can tell it was working because it helped clean some of the dead skin off my body, when I was ready to get out I simply rinsed off the excess oils and went about getting dressed as normal. I was left with silky smooth skin that is both soft and cool to the touch and my skin smells fragrant. My kids tested out the Pokeball and Totoro bath bombs, each one has a small toy inside that goes with the Fandom the bath bomb is modeled after. Both my kids loved their bath bomb and the bath bombs smelled divine, my absolute favorite was the Harvest Spice it reminded me of a freshly baked pumpkin roll. These bath bombs sell for $5 each and ship quickly, they were packed just right to keep them safe during travel. If I could change one thing it would be to have the list of ingredients included on either the bag containing the bath bomb or on a small card along with the bath bomb for gifting purposes. Want to see the Galaxy bath bomb in action? Stop by my Instagram page and check out the video I posted. One of my readers is going to win a six pack of assorted bath bombs. This will include a few of the surprise bombs that have toys inside. Shop owner will select which bombs you will receive but you may include any scents you dislike. Giveaway entry question: Please leave me a blog comment letting me know another bath bomb or scent you like from Dream Drop Bath Bombs. My daughter would like the MLP bath bombs. The pokeball bath bombs look fun! I love the calming lavender. I absolutely love the Galaxy Doughnut Bath Bombs! They are super cute and they are going to be a perfect gift for my best friend. Before I moved we would always go for doughnuts and thrift store shopping and I miss her so much. Thanks for sharing her awesome shop and the cool giveaway! Awesome stuff! The Lavender Bomb sounds heavenly to my sinuses right now. Jumbo Fairy Tail Bath Bomb mystery anime toy inside sounds like fun. I want to try the pokemon and MLP bath bombs for my kids. I absolutely love lavender bath bombs, I would love to try their version! It's so pretty! I'd also want to get the MLP/Pokemon bath bombs for my girls who love using them too! 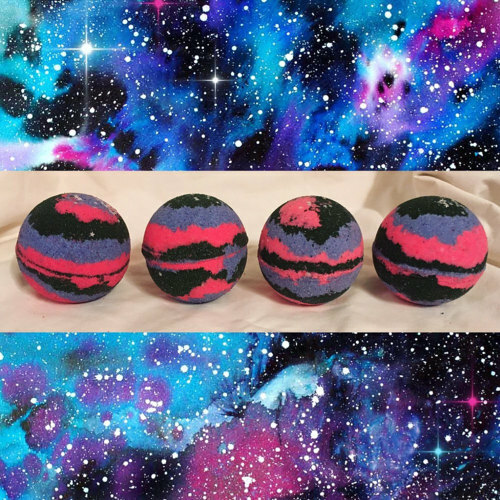 I like "Sunrise Bath Bomb"
I would love to try this: https://www.etsy.com/listing/490515504/mt-moon-pink-and-black-bath-bomb-that?ref=shop_home_feat_1. Thanks for sharing this! The Calming Lavender sounds lovely! I would love to try the volturi black bath bomb. It looks so pretty and has glitter! I love the Totoro bath bombs! Calming Lavender bath bomb sounds wonderful! This looks fun!! Hello Kitty Bath Bomb with a surprise toy inside! I like the Hello Kitty Bath Bombs from Dream Drop Bath Bombs. I love the Star Dust bath bomb. I like the Bath Bomb Custom 3 Pack. My daughter and I would love the zodiac bath bombs. I like the lavender ones. I really like the Zodiac sparkle bombs, but they all look lovely. The lavender bomb look great. I love anything lavender and the scent is very soothing. I like the My Little Pony bath bomb! I love the poke ball set. A great gift for all ages. I would love to get hello kitty bath bombs or the my little Pony bath bombs for my baby girl. She loves taking baths. Jumbo My little pony surprise bath bombs please. The my little pony bath bombs are so cute! I think the 6 pack Pokeball Bath Bombs (with a mystery Pokemon toy inside! )are cool! I like the Pokemon and the Galaxy Doughnut Bath Bombs. The wicked scent sounds amazing! I love the Hello Kitty Bath Bombs, they would be my daughters favorite! The galaxy doughnut bath bombs sound awesome! I like the Mother Earth Bath Bomb. It looks so pretty! The My Little Pony bath bombs would be a huge hit in our house!! My daughter would love to have the 1 Jumbo My Little Pony Mystery Toy Bath Bomb! 3 Pack Star Dust Bath Bombs. No staining on skin or bathtub, 5.5-8 oz (large and packed with beneficial ingredients) highly pigmented! I love the my little pony bath bombs! Also love that I can customize my own 6 or 12 pack! I love the Hello Kitty Bath Bombs! I NEEEEED THE POKEBALL ONES!!! awesome! !